The Australian Geoscience Council and the Australian Academy of Science are pleased to announce the latest recipients of a travel grant under our 34th International Geological Congress Travel Grant Scheme for Early-Career Australian and New Zealand Geoscientists. Five geoscientists in the early stages of their careers have received funding to travel internationally to undertake activities that will be of benefit to Geoscience in the Australian region. Read more on their projects here. As the peak body for Australia’s 8,000 geoscientists, the Australian Geoscience Council (AGC) has strongly welcomed commitments from both the Coalition Government and Australian Labor Party to boost support for the exploration of ‘next generation’ hidden mineral deposits in Australia. “While Australia is endowed with significant mineral resources and the resources sector contributes massively to our economy, the ‘easy to find’ minerals of past decades have largely been discovered and exploited” AGC President, Dr Bill Shaw, said today. Read a report by Science and Technology Australia, Australia’s peak body in science and technology – representing about 70,000 Australian scientists and technologists working across all scientific disciplines. 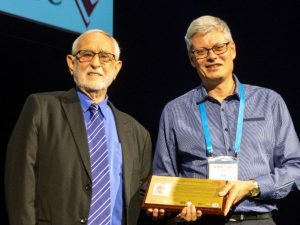 In pursuit of its inclusion as a Geoscience advocacy opportunity under the current AGC 2015-2020 Strategic Plan, the Australian Geoscience Council recently appointed Angus M Robinson FAusIMM (CP) to coordinate the process of developing a draft National Geotourism Strategy under the umbrella of the AGC Advocacy Sub-committee. AGC is pleased to publicly release the Australian Geoscience Tertiary Education Profile 2017. 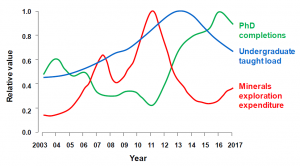 The report summarises data collected in a 15 year longitudinal study of Geoscience departments across Australia, including teaching loads, higher degree completions, staff numbers and other data. Further information, including links to previous reports, can be found here. On 17 October 2018, during the Australian Geoscience Council Convention in Adelaide, we announced two new National Geoscience Champions. Dr Marita Bradshaw and Emeritus Professor David Groves have joined Roy Woodall AO, our inaugural National Geoscience Champion, as leading Australian Geoscientists recognised for their major contributions to our science, craft and art, as evidenced by their technical, leadership, mentoring and collegial endeavours. Read more about our National Geoscience Champions. Applications are now being accepted for our 34th International Geological Congress Travel Grant Scheme for Early-Career Australian and New Zealand Geoscientists. 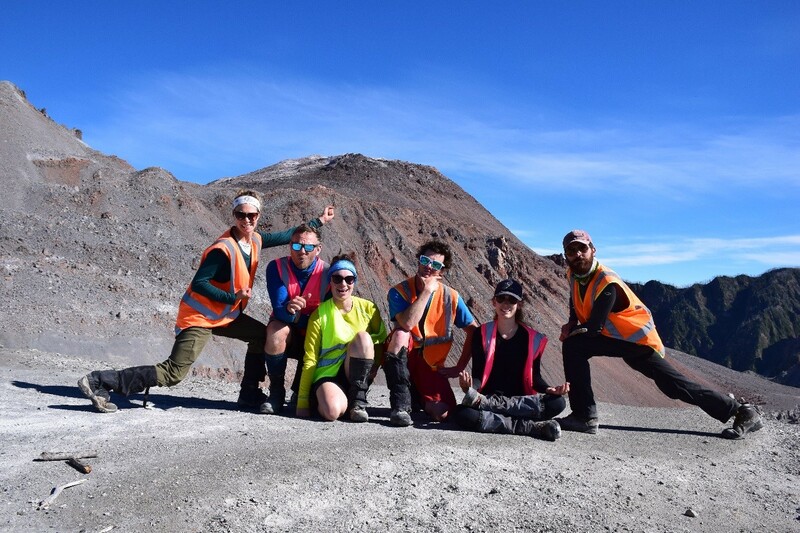 This scheme provides funds to support travel by Australian and New Zealand geoscientists in the early stages of their careers. The application deadline has been extended to 14 December 2018. Check out the details on how to apply and previous grants awarded. 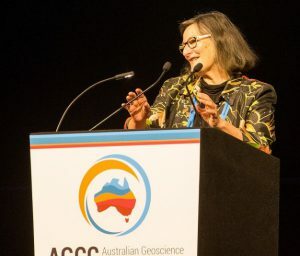 Earth Science Week 2018 in Australia was dominated by the inaugural AGC Convention “Big Issues and Ideas in Geoscience” (14-18 October in Adelaide). There was something for everyone at AGCC 2018, including the comprehensive technical program, events celebrating Diversity in Geoscience, opportunities for Early Career Geoscientists, and the Santos Education Workshop for science teachers. In November 2015, AGC recognised Roy Woodall as our inaugural National Geoscience Champion. In August 2015 we released a Position Statement on Recommendations for the General Syllabus for an Undergraduate Degree in the Geosciences. In February 2014, AGC became a supporter of the inaugural Australian Earth and Environmental Science Olympiad – read more. Go to the Media Releases to get more information on the inaugural Australian Earth and Environmental Science Olympiad, of which AGC was a sponsor, published in ASEG’s Preview newsletter. The National Rock Garden in Canberra was inaugurated in October 2013. A Master Plan for the Garden can be downloaded here (17 Mb file). Links to presentations from the UNCOVER Summit held in 2014 are available here. Related presentations from a 2013 session at the ASEG Conference are also available on YouTube. Access the AGC’s report AUSTRALIAN GEOSCIENCE TERTIARY EDUCATION PROFILE 2012 is here. This report provides a review of the state of university geoscience education and training and repeats surveys conducted in 2007 and 2010. The AGC was the proud sponsor and organiser of the 34th International Geological Congress held in Brisbane from 2-10 August 2012 (www.34igc.org). The 34th IGC General Proceedings report is available for download.